We rely on data as the motivation behind so much of what we do, particularly in a business setting. Evidence based decisions are often the wisest because you have the data to back your actions, predicting the assumed benefits to come. Trends in the data and statistics describing the data can be difficult to understand, though, especially when there are large quantities to analyze. When reporting to a group about data, there are a few tips to keep in mind so that your audience can follow the significance of what you are presenting. This will ensure that the data is understood and the listeners know what they can do with it rather than “data dumping” all of the information you have available in an incoherent fashion. Try to have only one idea per slide or screen. Having combined graphs or even multiple graphs on one slide can be overwhelming for the viewer. As Search Engine Watch describes, it’s important to remember that your audience is both looking at your presentation as well as listening to you. Therefore, to have an effective presentation, your visuals must be as straightforward as possible. Make the data visually appealing. This includes simple things such as the color scheme of your presentation. Contrasting colors will make it easier for your audience to see. Additionally, choosing the right kind of visual is essential. 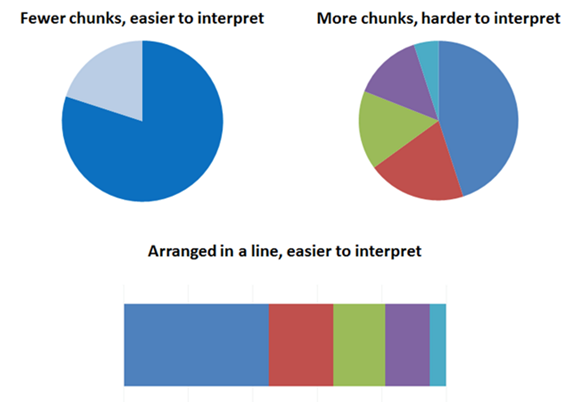 For example, would a bar graph, line graph, or pie chart best suit your data? Say you choose a pie chart. The next step is to make sure that there aren’t too many wedges, which would make your viewers have to pause to fully understand what you are explaining. Instead, be creative and reformat the pie chart horizontally as shown below. With statistical and graphing software, you have endless options! Give background. Search Engine Watch describes this as an imperative part of your presentation. You can’t just jump into big groupings of data without explaining what the significance of your project was. Start off with the problem you are addressing, and logically flow into the real life examples (your data) that back your claims. This can help eliminate questions right away and lead to a more straightforward presentation. Include context for the data. You can throw out big statistics like changing averages over the past few months, however, this has no real meaning to your audience without comparing it to other data. For example, Search Engine Watch shows a line graph with 2 years of data overlaid on top of one another. This allows the audience to clearly see how the current year’s data has changed from the past. Articulate the need that your data is addressing, then end with a call to action. From the very beginning, you know you are making this presentation for a reason, so Harvard Business Review suggests that you lead your presentation with that reason. There is a specific company need that you are focused on, whether that is changes in sales or changes in social media followers. If you articulate this need throughout your presentation, the reason for the trends in your data are more straightforward and your audience will feel inspired to take action. You can even end with a specific call to action for your listeners to follow. They now know about the issue you researched, and with the help of your data, have evidence to back them on the next step towards solving the problem. By following these appearance and content guidelines for your presentation, your audience will easily understand the significance of your data and will walk away with a specific action plan.